Discover this scenic getaway with visits to Guilin, Yangshuo, the Longji Rice Terraces and the Sanjiang Dong Ethnic Minority Villages. During this visit travelers will experience the highlights of the region but with its own unique twist to get off the beaten track. This tour is held over 6 days and 5 nights with your own experienced Wendy Wei Tours local guide. 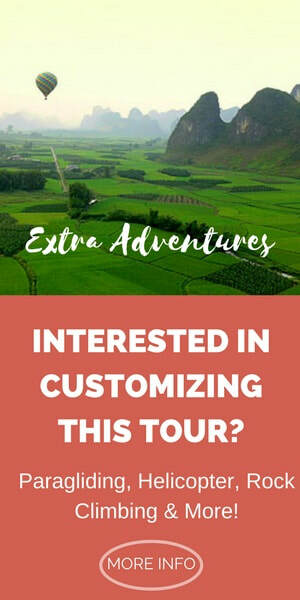 Visitors stay in a variety of different places throughout the tour including Yangshuo, Guilin, the Longji Rice Terraces and Sanjiang/Chengyang. This tour consists of full days and some evenings with activities. Meet your tour guide in the morning and begin the day with some Guilin Noodles at a noodle shop famous among local residents. After breakfast, travel to Cuiping Hill and walk up to the peak of the hill to admire the views of the surrounding rivers, karsts and rural countryside – a great introduction to Southern China! Following Cuiping Hill, visit a rural market day (subject to dates) and see firsthand a rural Chinese market, which is one of the few remaining traditional markets in the area. In the afternoon cycle around the Yulong Valley, exploring the countryside and villages on the different tracks available. After cycling, board your own private raft to experience a relaxing journey on-board a small non-motorized raft. 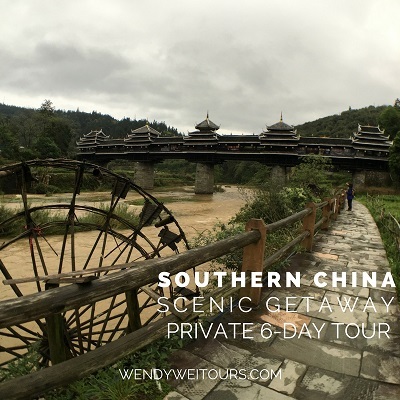 The Yulong River winds throughout the Yangshuo countryside with beautiful rural scenery either side of the river. Enjoy your evening at leisure. Start the day by travelling to Xingping and boarding your own private Li River Cruise raft to travel along the Li River. During this journey that lasts for just over an hour, you will see the most famous section of the River as well as see firsthand a private Cormorant Fisherman demonstration. You will then depart Xingping and travel to Xianggong Hill – a famous landmark providing spectacular views overlooking the Li River and its surrounding scenery. Afterwards, visit the nearby old stone village of Shitoucheng, which is a historical old village located in the Yangshuo countryside before continuing to Guilin. In Guilin, walk around the city lakes, the central pagodas and taste some local snacks, if this is of interest before enjoying the remainder of the evening at leisure. Today, the tour will start with a visit to Yao Mountain, which offers views overlooking all of Guilin and the surrounding countryside. Afterwards, continue to Daxu with a visit to one of the local resident’s homes (who has kept a collection of different antiques throughout China’s history) and enjoy a unique experience viewing his antiques. Thereafter, return to Guilin City and enjoy the afternoon at leisure, before commencing a Guilin Food Tour tasting the local specialties and more! Meet your tour guide in the morning and depart to the Rice Terraces, which takes approximately 2.5 hours from Guilin. Upon arrival, you will be transferred to the Longji Zhuang Ethnic Minority Village and explore the village with its old architecture and experience life first-hand. For lunch, enjoy a traditional meal in a local family’s house (cooked in a restaurant kitchen). Explore the Dong ethnic minority village of Gaoxiu to get a first-hand experience of life in the Dong minority lands of Northern Guangxi Province. This village is a very quiet and off the beaten track village with some beautiful buildings featuring Dong minority architecture. Afterwards, take a high-speed train back back to Guilin and walk into the halls of Reed Flute Cave. Following Reed Flute Cave, either enter Elephant Trunk Hill or view the Elephant Trunk Hill and pagodas from a nearby cafe.